A couple of weeks ago a fellow writer and I had a discussion regarding Bruce Campbell’s Unified Theory of Jessica Alba. As a result of that conversation, I began thinking about other actors who have made significant impacts on popular culture. There is a concept that exists about Kevin Bacon called Six Degrees of Separation that everyone has played with at one time or another. If you aren’t familiar with it, you take a Kevin Bacon movie and try to connect him to other actors. For example, Kevin Bacon was in Hollow Man, which starred Elisabeth Shue. So, Elisabeth Shue starred in Leaving Las Vegas with Nic Cage who starred in The Rock with Ed Harris who starred in Apollo 13 with Kevin Bacon. Basically, connecting the dots proves that everything usually comes back to Kevin Bacon. This led me to create a theory of my own. I am calling it The Bruce Campbell Factor. What could this possibly mean, you might ask? Well, much like a talisman, Campbell has been in several films where his co-stars, directors or writers have gone on to bigger and better things. In other words, if he is in your movie consider yourself lucky. The most obvious example of this premise is Sam Raimi. Raimi and Campbell met in high school and became friends. Sam’s first directing effort was a film in 1977 called It’s Murder! Bruce was cast as Police Officer on Bicycle. Raimi’s next move was a little number in 1978 called Within the Woods. That short went on to be developed into the iconic horror movie, The Evil Dead. Next up is the Coen Brothers. Oddly enough, Joel Coen edited The Evil Dead, which starred Bruce Campbell. The Coens also wrote the obscure movie Crimewave, which again features Bruce Campbell. Campbell even turned up in their fake proof of concept trailer, that would later become Blood Simple. To this day, the brothers still use Bruce. You can find him in Fargo as the actor on the soap opera that Peter Stormare’s dead-eyed Gaear Grimsrud is watching in his cabin hideaway. The soap opera happens to be Generations, a show that Campbell starred in while living in Detroit. He also plays the role of Smitty in The Hudsucker Proxy. In 2015, Bruce played former president Ronald Reagan in the hit television show, Fargo, a show that the Coen brothers would help to produce. In 1992, Quentin Tarantino burst onto the Hollywood scene with his first film, Reservoir Dogs. At the same time, QT featured in a quiet little movie called Eddie Presley with none other than, you guessed it, Bruce Campbell. Is the pattern starting to emerge yet? After the success of Reservoir Dogs, Quentin went on to helm a slew of smash hits from Pulp Fiction to Inglorious Basterds to Django Unchanged, and most recently The Hateful Eight. A little bit of Bruce magic goes a long way. Liam Neeson has been a working actor since the early 80s. He starred in some movies with prominent talent but he was usually a supporting player. However, in 1990, he played the lead role in Sam Raimi’s Darkman. Campbell appeared in the movie in a surprise cameo. Three years later, Neeson was an Oscar nominee for Schindler’s List. After that film, he appeared in Rob Roy, and we all know he became Qui-Gon Jinn in Star Wars: Episode I -The Phantom Menace. In 1996, celebrated playwright John Logan wrote a TV script, Tornado. Bruce starred in that telemovie. Subsequently, Logan went on to pen Any Given Sunday for Oliver Stone and Gladiator for Ridley Scott. The much-anticipated Alien: Covenant is also written by him. Dana Ashbrook appeared in Sundown: The Vampire in Retreat along with Bruce. The very next year, Dana landed a plum role as Bobby Briggs in David Lynch’s cult sensation, Twin Peaks. Ashbrook will be reprising his part in the upcoming revival on Showtime in May. 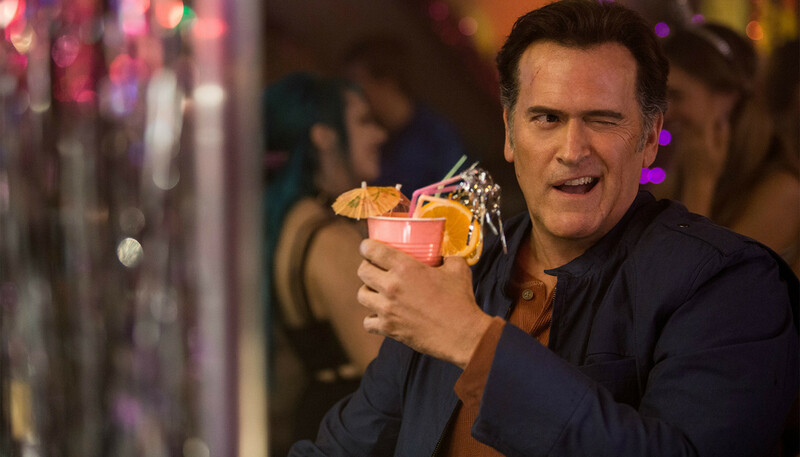 Having Bruce Campbell in your movie is like striking gold. Not only is he talented and versatile, but he seems to elevate any production that he stars in. He is in my opinion, the hardest working actor in Hollywood. Thanks, Tim! I appreciate you dropping by & commenting as usual. It was fun to explore. You really have a thing for Bruce don’t you. I loved him in Burn Notice. I have a lot of Sam in me except for things going boom. That is good to know, Don. Having Michael Westen things happen on a daily basis can be rough. Thanks for commenting & reading my theory. Campbell is a versatile actor & I hope to see him for many years. LOL. It’s what I do! Thanks for giving it a read, Theresa. Always appreciate the support. Yes! Thanks for the read, Mike!